Well now, another review of my Buzzing! book has come to my attention. 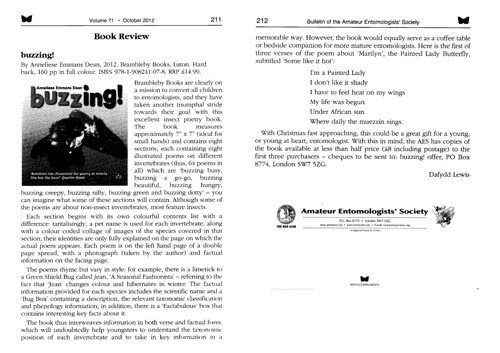 It was published in the Bulletin of the Amateur Entomologists’ Society (AES) last autumn, and describes Buzzing! as ‘an excellent insect poetry book’, providing a ‘triumphal stride’ towards encouraging all children to become entomologists! The AES have invited me to perform poems from my Buzzing! book at an event they are holding at the Natural History Museum in London on 25 May. I look forward to meeting some keen young entomologists there! Meanwhile, if you’d like to have a read of Buzzing! yourself, you can buy copies here.